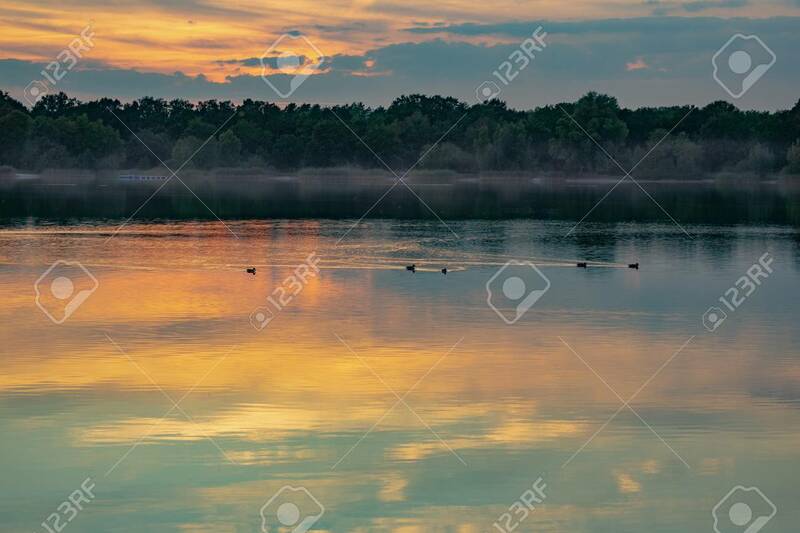 Immagini Stock - A Gorgeous Orange Blue Sunset On The Lake, The Silhouette Of A Forest And Trees On The Horizon And A Duck Sailing Past, Leaving Ripples On The Water. Image 115569339. Archivio Fotografico - A gorgeous orange blue sunset on the lake, the silhouette of a forest and trees on the horizon and a duck sailing past, leaving ripples on the water. A gorgeous orange blue sunset on the lake, the silhouette of a forest and trees on the horizon and a duck sailing past, leaving ripples on the water.